Sign up for Broadjam today to follow MilkDrive, and be notified when they upload new stuff or update their news! MilkDrive, the Austin alt-folk-progressive acoustic string band, actually got its start in the northern climes of Idaho, where principal songwriter-multi-instrumentalist Noah Jeffries grew up playing bluegrass and gospel. Jeffries moved to Austin and moved in with fiddling champion-mandolin player Dennis Ludiker, a member of South Austin Jug Band that Jeffries had met long ago when both were competing in the National Old-time Fiddle Contest in Weiser, Idaho, as kids -- as well as the young Brian Beken, who would also ultimately join the band. 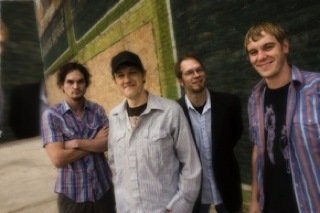 With the addition of Matt Mefford on bass, the band was complete and became MilkDrive. Ludiker holds fiddling championship titles from the 2008 Texas State Contest, 2002 Walnut Valley Music Festival and 2001 Washington State Open. Beken was 2004 Texas Flatpick Guitar Champion. Jeffries won a Lionel Hampton International Jazz Festival Jazz Guitar Competition.